Back in April, Bedell Cellars released the first wine in its Artist Series. To get the Eric Fischl-designed label on that 2001 Reserve Merlot, you had to dish out $200 bucks for a magnum (750ml bottles are $30, but don't have the special label.) Probably out of most of our price ranges...even if I think it's the best wine I've tasted from the winery. The label was designed by reknowned artist Barbara Kruger, a reknowned artist whose artwork has appeared in galleries and museums as well as on billboards, buscards and posters. 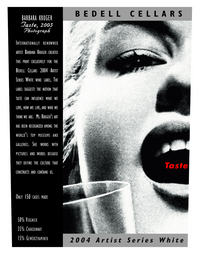 The wine's label (pictured right) features a black and white image of a woman's face with the word "Taste" written in red over the woman's mouth (thus the wine's name). Tongue: This wine is medium-bodied and tart with lime, honeydew, cantelope and even a little fig flavor. It's very bright and crisp and yet the finish is a bit coating and lingering. The Real Wine World, a new project by the good doctor will track one year of making and selling wine in three different parts of the world -- via a blog/website. What's next? Survivor Napa? Who Wants to Marry a Vineyard Manager? The Apprentice Winemaker? The Real Wine World...check it out...and keep going back. New York State has passed direct shipping legislation. This is a reason to celebrate. Now, if I read about a great, small winery in Oregon or California...I can call them up and order some vino. Ten days from this evening, on July 8th, Nena and I will be standing together on a covered bridge in Schoharie, NY, surrounded by the people that mean the most to us as we are joined in marriage. It is certainly cliche, but when I met Nena almost four years ago, I knew instantly that my search was over. I knew that I had found my best friend for life and the woman I would grow old with. What started back then as a first date at a sushi restaurant has grown into the relationship we've both looked for all our lives. Nena, in these four years, you've always pushed me to pursue the things that I love. You recognized my passion for wine and wine writing probably before I even did, because you certainly know me better than I know myself. You brought it out in me with shared love and longing for the best in food and the best in wine. We've learned so much together and from one another, none of my modest success writing for local papers would have ever happened without you...and for that I thank you and will always be grateful. You inspire and challenge me every day. Whether telling me that it's important to drink non-Long Island wine, reminding me that complicated food isn't always better or making one of the delicious dishes that I simply can't replicate, you are infinitely tolerant of my obsessive, quirky tendencies. You always bring me back to reality but at the same time push me to dream and pursue them. And of course your deft palate for white wines adds unbelievable detail to my tasting notes. Nena, you mean the entire world to me and more. I can't imagine my life without you. But, I can only assume it would be a dreary, boring, un-inspiring world filled with bad take-out and little fun. You are my best friend, the love of my life and my muse. I can't wait to become your husband and begin our lives together as man and wife. I love you with all my being and know that I always will. In yesterday's New York Times, Howard Goldberg wrote a piece listing some of the tasting rooms (and wines) that visitors should check out when touring our wine trails. He also lists the places I consider "touristy" spots...Pindar, Martha Clara Vineyards and Palmer Vineyards. Touristy, in my definition, just means that the overall wine quality isn't the best, but the tasting rooms and other ammenities are very consumer friendly. Each does have at least one wine of note however. Howard is obviously writing for a wide audience...New York Times subscribers. But, I would have liked to see him list at least one small producer that people might not know about. Where's Waters Crest Winery? Where's the mention of Lieb Family Cellars (which is attached to Premium Wine Group) and their Pinot Blanc? (Update: Turns out he mentioned Lieb in his column on Sunday). Maybe a mention of Sherwoodhouse Vineyards or Roanoke Vineyards' merlot? I would have had a slightly different list, that's for sure. And, anyone of you who have asked for my list in the past can compare. I also had to smile when I saw the title of his piece: A 'Sideways' Tour of Long Islands' Tasting Room. Especially when I had a story published over a week ago titled "A Sideways Look at Laurel Lake Vineyards." Is Howard reading my stuff? I doubt it, but in my own mind, I'm a legend already. Two wine blogs that I read regularly, BasicJuice and The Silk Roaf of Wine have mentioned a new online wine retailer -- Winemonger.com -- that focuses on Austrian wines. This is great news for anyone who has ever wanted to taste some Gruner Veltliner but had a hard time finding it in local wine shops -- which was me until recently. And, the have a decent selection of Austrian reds as well...including some blaufrankisch. As the resident wine aficionado (or geek) at Dan’s Papers, I’m “forced” to taste several wines each and every week. In just under a year with the paper, I’ve already filled up one whole notebook with notes and comments and have started another. It’s hard work, but someone has to do it, right? Through hundreds (thousands?) of sips, I’ve learned that when I taste a winery’s new releases, I can almost always find at least one I enjoy. Just about every winery on Long Island has at least one noteworthy bottling, or at least something that shows potential. It’s truly rare that I dislike everything I try. This week, as I sampled wines from Sherwood House Vineyards in Mattituck, something even more rare and extraordinary happened – both were remarkable and delicious. In fact, for the first time, each release scored an A- in my blind tasting. Owned and operated by Charles and Barbara Smithen, Sherwood House Vineyards is the manifestation of an intense passion for both wine and the East End. A cardiologist and vintage jewelry dealer, respectively, they purchased their 1860 farmhouse in 1996 and planted their vines soon after. 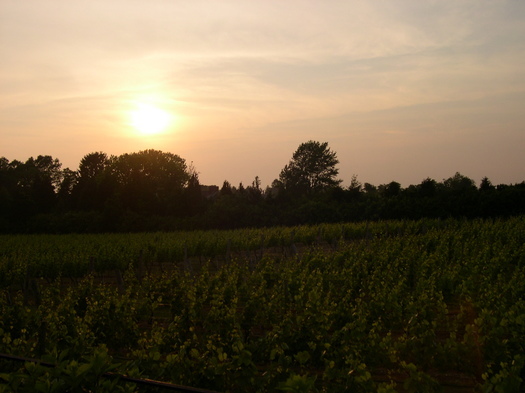 In 1999, after selling off their grapes to local wineries for a few years, the Smithens decided to make their own wine, a Chardonnay. Since then, they’ve focused solely on Merlot and Chardonnay, and have developed a bit of a following among those who have tasted them. After tasting these wines, I’m a believer, too. The Sherwood House Vineyards 2001 Merlot ($22) is a well-extracted and rich example of Long Island’s showcase varietal. The nose offers ripe raspberry aromas with a mineral background and light oakiness. On the palate, the raspberries are joined by vanilla cream and more minerals. This medium-bodied wine is highlighted by sultry tannins, a soft-but-rich mouthfeel and an indulgent, lingering finish. 600 cases were produced. While garnering the same grade in my tasting, the Sherwood House Vineyards 2001 Chardonnay ($20) is even better. A light, shimmering gold in the glass, its nose is refined and light, offering Bosc pear, vanilla and hints of toast. Full-bodied but far from heavy, this exceptionally balanced chardonnay displays lithe pear flavors with hints of tropical fruit as well as butter, toast and minerals. I don’t think there’s a better 20-dollar chardonnay on the North Fork and few will cellar as well, either. 645 cases were produced. Because they don’t have their own tasting room yet, these wines are available for tasting and purchase at both The Tasting Room locations, one in Jamesport and one in Peconic, or at www.tasting-room.com. The Smithens do have plans for their own tasting room however, opening in the next 18 to 24 months. 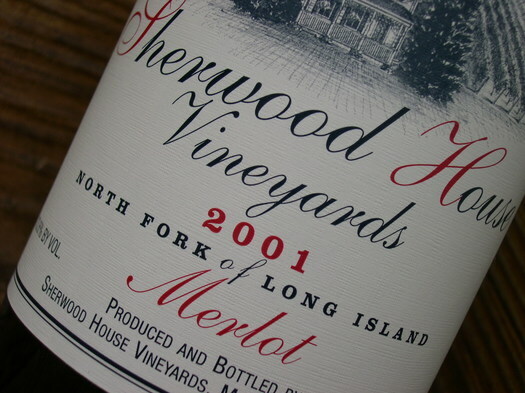 Sherwood House Vineyards will also be releasing its 2002 Chardonnay in the fall and a 2002 Merlot in the early winter. They are also working on their first Cabernet Franc bottling, which will be released sometime in 2006. For more information on Sherwood House Vineyards, visit www.sherwoodhousevineyards.com or call 298-2157. In 1994, Harold Watts, a former economics professor at Columbia University in New York, bought five acres of land on Alvah's Lane, just off Route 48 in Cutchogue, NY. Not long after, he planted his vines -- merlot, cabernet sauvignon and cabernet franc. And, in 1997 Ternhaven Cellars was born when he opened his tasting room and production facility in Greenport, NY...in a rennovated gas station. I guess you could say he's a New York garagiste. I just got an email from my for-print editor...and she needs five (yes, five) stories for Monday. Turns out that we have a wine guide insert for the 4th of July weekend (she never told me before now)...and as the wine writer, I've got to fill the pages. So, between now and Sunday, I'll be drinking blind tasting at least a dozen different wines, making a few phone calls, sending off a couple dozen emails and typing away like a mad man. Oh, and cooking for eight of our closes friends Saturday night. Oh...and going to an event at one of our favorite wineries as well. It's going to be a busy weekend...but I'll have lots of tasting notes for LENNDEVOURS in the end. Snapple's Giant Ice Pop -- In June!?!? Why on earth would Snapple attempt to break the world record for largest ice pop in June...in Manhattan? If you're in the mood for a dinner party-sized frozen treat, try this recipe for Pink Grapefruit, Strawberry and Champagne Granita. And even though it's not Champagne, if you're in New York, you should make it with Lieb Family Cellars 2001 Blanc de Blanc...which is a sparkling pinot blanc. Taking a page out of Jaime Goode's book, I've decided to start taking pictures every Sunday of the wines Nena and I have tasted the week prior. It was a relatively small lot this week...I expect it will grow the next couple of weeks as I pre-write several columns for July (when I'll be out for our wedding and honeymoon). 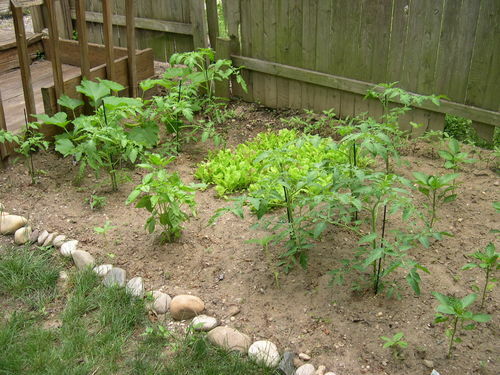 As you can see in the picture above, our first garden is growing quite nicely. The zucchini and tomatoes seem to be doing particuarly well, with the peppers and cukes doing okay in their own right. Our basil plant is getting a bit unruly (need to start using it more!) but some of the herb seeds we planted are starting to poke their heads through the dirt too. 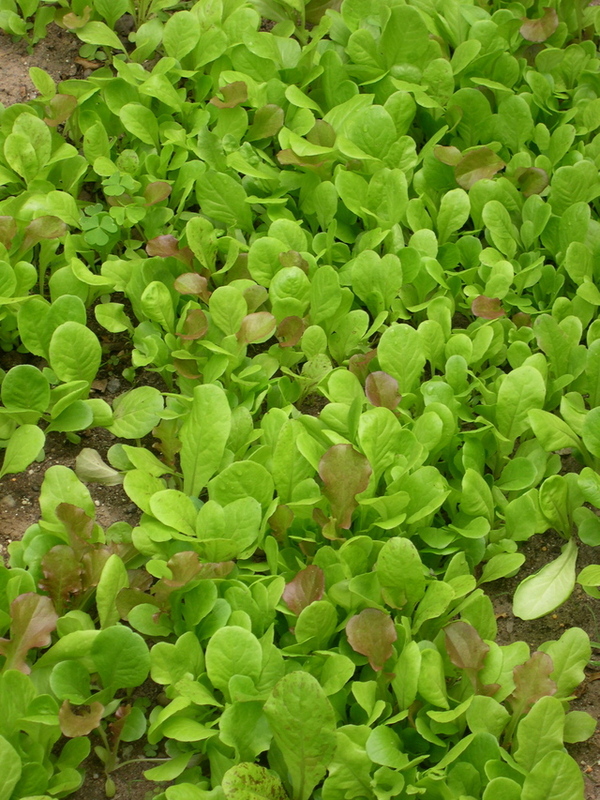 Now that it's growing (and going) so well, I really wish we had planted more. It's still not bad for a first garden though. I'm definitely hooked. 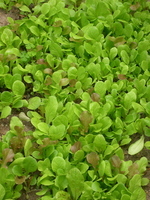 I'm particuarly proud of how are mixed lettuce greens are coming along...I think we'll be having our first salads soon. Maybe we'll even serve them at our first BBQ of the season...coming up next weekend. Ever since the release of the movie Sideways, pinot noir has been the “it” wine. Even here on Long Island, I’ve been told stories about customers walking into a tasting room and buying bottle after bottle of pinot noir – without even tasting it or knowing how much it costs. As difficult as Pinot Noir can be to grow and make (well), that sort of impulse buying seems a little silly to me. But of the handful of Long Island wineries that make it, most do it well, including Castello di Borghese, Broadfields Wine Cellars (under the Tasting Room label) and Wolffer Estate. While the pinot is the standout of the wines I tasted, Zamorano’s 2002 Chardonnay Estate Bottled Reserve ($16) isn’t far behind. It is complex on the nose with tropical fruit aromas of pineapple and papaya mingling with hints of toasty oak, vanilla cream and spice. Medium-to-full bodied, it displays a nice balance between clean fruit character and toasty oak influence on the palate. The finish, which starts with pineapple and cream, finishes with hints of sweet spices. At $16, this is a very good buy and at $11, the 2003 Chardonnay is an even better one if you like less oak and more pineapple and citrus flavors. 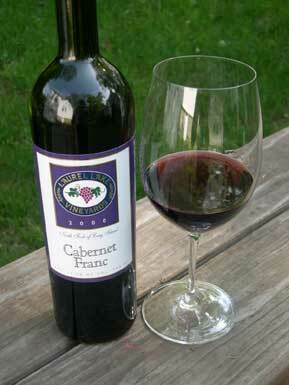 The 2000 Cabernet Franc ($15), slated for a July release, is a little rough and angular right out of the bottle, but with a few hours to breath, its substantial tannins open up some to reveal spicy, peppery cherry flavors underneath. A year from now, I plan to taste this one again. A respectable 2000 Cabernet Sauvignon ($15) is fuller bodied and fruit forward with raspberry and blueberry flavors, but I found the finish to be a little raw with oak, though it was also sprinkled lightly with cinnamon. It’s not a new release, but the Laurel Lake Vineyards 2002 Syrah ($19) is a promising, full-bodied red that is another varietal to watch at Laurel Lake Vineyards. It’s one of the best ones made locally. In a few years, I also look forward to trying the first Laurel Lake Vineyards sauvignon blanc. They just planted four acres this year. Laurel Lake will be hosting two harvest festivals this fall – one on Saturday, September 25, and another on Saturday, October 5. Festivities include a gourmet lunch, special vineyard tours, hay rides, barrel tastings, grape clippings and cheese pairings. 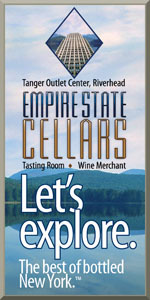 For more information on Laurel Lakes Vineyards, its wines or its harvest festivals, visit www.liwines.com or call 631-298-1420. Sherwood House Vineyards is owned and operated by Dr. Charles Smithen, a New York City-based Cardiologist and his wife Barbara, a vintage jewelry dealer. Charles' love of and passion for wine really started in the 1960s when he was working in England...and took regular trip to French wine country. After moving to the North Fork of Long Island and planting vines, they started by selling their grapes to local wineries for three years before deciding to make their own wines -- starting with a 1999 chardonnay. They now make chardonnay and merlot, and their wines are available for tasting and purchase at both The Tasting Room (a co-op tasting room for small, artisanal producers) locations. Tongue: Full bodied but far from heavy, this exceptionally balanced chardonnay displays lithe pear flavors with hints of pineapple as well as delicate notes of butter, toast and minerals. Overall: Flavorful, moderately complex and elegant, this is one of the best North Fork chardonnays I've ever tasted...and it will only evolve and get better with some aging (which I find rare in most North Fork chardonnay). 645 cases were made. Wine Blogging Wednesday must be butter...because it's definitely on a roll. Who can take this juggernaut of a blog event to the next level? That's right...for July we look to UTAH of all places to one of my favorite blogs (and bloggers). July's host is none other than the always informative and interesting Beau of basicJuice. His theme is a great one...and one that I hope will draw many into the WBW fold -- Off-Dry Wines. The date is July 6th...which is the day I head to upstate NY in preparation for my wedding to Ms. LENNDEVOURS (which I guess means she'll be Mrs. LENNDEVOURS). Not sure what qualifies as off-dry? Head on over to the annoucement to learn more. In an interview in the New York Times, superstar Chef Eric Ripert mentions that his "...everyday wines, which I call common wines, I buy from Long Island wineries by the case." Now I'm going to have to try to track him down to find out what ones he drinks! As any of you on the eastern seaboard are aware, we've been having some seriously hot and humid weather the last week or two. It's supposed to reach 90+ today...which isn't common for Long Island this early in June. I bring this up because that very heat wave has forced me to move all of the wine that doesn't fit in our wine fridge into our BEDROOM of all places -- because we keep that room cooler (via A/C) all day. Luckily, Nena is very patient with my wine pyschosis and there is room behind our door to store the 100+ bottles out of sight. First, I've become a full-fledged wine nerd. I've only been serious about wine (and I mean seriously serious) for a little over a year. Before this heat wave, I would have never bothered to move wine from the hottest room (one without A/C) to a room with it. This year, I was actually physically upset at the thought of my beloved vino baking in the heat. I'm obsessed now...but I'm really okay with that. 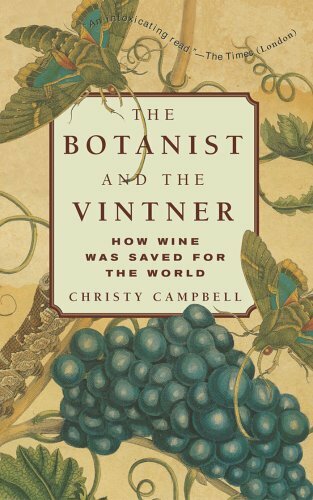 I also need to remember that while I am and always will be a wine lover, I'm also a wine writer now too. Of the 100+ bottles I had to move, more than half is "work" wine...wines that I need to taste for various publications/projects. Why do I have such a back-up of wines? Because I still haven't gotten used to the idea of tasting wines without drinking the entire bottle within a day or so. Because we have so few friends that are into wine, I find myself "saving" work wines until either we visit my in laws or have a dinner party where one or two attendees really like wine. I guess I just don't like seeing good (or even mediocre) wines going to waste. The transition to "professional" is well under way...and I didn't even realize it. So, I guess while I can still "save" wine from my own reserves...I need to do a better job of keeping on top of my tastings. With this new revelation in mind, keep an eye out for many more tasting notes...and if any of you happen to be out near my house, stop by -- I'm sure I'll have some opened, but only partially consumed bottles of wine that you're welcome to. In a recent issue of Wine Spectator, columnist Matt Kramer wrote a thoughtful piece discussing large wineries versus smaller ones, concluding (convincingly) that smaller really is better. Though Kramer doesn’t define what a “small” winery is, you can take my word for it – most, if not all, Long Island wineries qualify. Of course, being a small winery doesn’t automatically mean your wines are any good. Anyone who has tasted wines from some of our lesser local wineries can attest to that. After all, doing the wrong things in the vineyard or in the cellar will lead to poor wines, regardless of how big your operation is. Salvatore Diliberto, owner and winemaker of Diliberto Winery in Jamesport, is doing all the right things – and doing them himself. He’s truly a one-man winemaking show. He planted his first vines in 1998 and first harvested fruit in 2001, a locally well-regarded vintage and one that led to two of the three gold medals he won at last summer’s New York Wine & Food Classic. Diliberto isn’t new to Long Island fruit, however, having used it to make wine in his Queens basement since 1986. 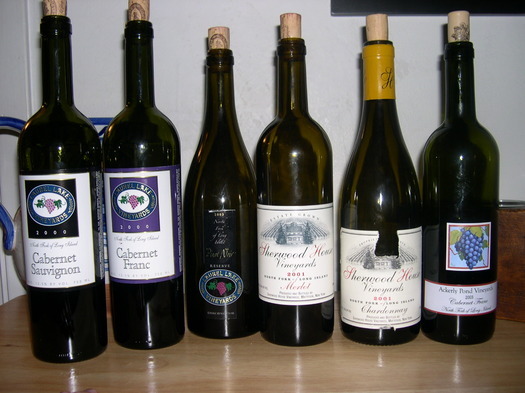 I tasted all four of his current releases, all reds, and found each of them appealing and extremely food friendly. 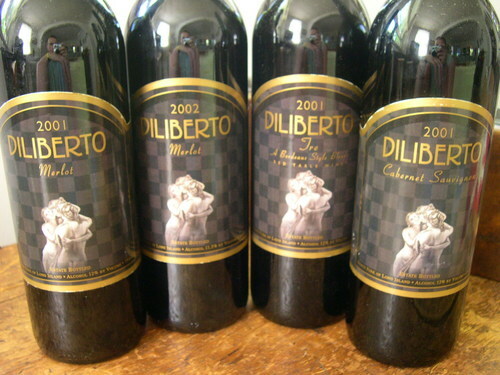 The Diliberto Winery 2002 Merlot ($20), one of the gold medal winners, is a charmingly soft and straightforward wine with plum, cherry and light raspberry flavors. It’s medium bodied with fairly low tannins and a slightly lingering finish that offers faint hints of vanilla. I’d serve this with pasta and red sauce and similar Italian fare. 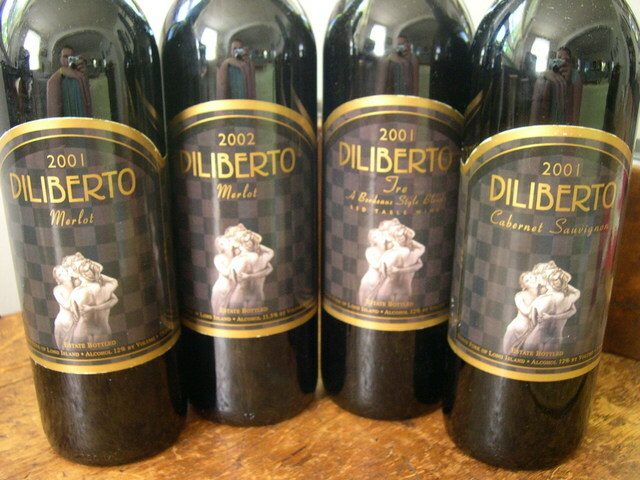 While still relatively simple, the Diliberto Winery 2001 Merlot ($22) is richer and more extracted in the glass. Rustically elegant, it is fuller flavored and offers more intense cherry and raspberry flavors with earthy notes in the background. The tannins are firmer than in the 2002, but still well integrated. This wine, another award winner, has better aging potential and can stand up to more serious meat dishes. This was my favorite of the lot, getting a B+ in my notes. The last of the gold medal wines, the Diliberto Winery 2001 Tre ($25) is a Bordeaux-style red blend that offers a bit more complexity. Though still offering black cherry flavors, this wine shows a spicy, black pepper character that makes it stand out. I think this blend would benefit from another year or so in the bottle to round out its flavors and tannins. The Diliberto 2001 Cabernet Sauvignon ($25), while maybe overpriced, is another enjoyable, food-friendly wine. I enjoyed its nose, which offers raspberries, blueberries and vanilla. On the palate, it’s fuller bodied than Diliberto’s other wines and while nowhere near a California Cabernet, it out-flavors many local bottlings. Until their tasting room opens in early 2006, you can contact Diliberto directly to set up an appointment to taste and purchase his wines. 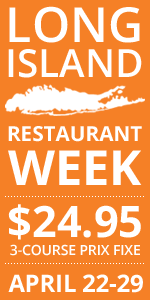 Call 722-3416 or email diliberto1@msn.com. Welcome to the 10th vintage of the virtual wine tasting event Wine Blogging Wednesday, hosted by Alice from My Adventures in the Bread Box. The theme? White pinot. Let me first say that I had originally planned on picking up a bottle of Lieb Family Cellars' pinot blanc...a varietal they specialize in here on Long Island and one of my favorite non-riesling whites. But then I received my wine club shipment from Channing Daughters Winery in the Hamptons...and what do you know...there was a bottle of their 2004 pinot grigio in there. I've written about Channing Daughters and their wines several times before ( 1 | 2 | 3 | 4 ) before and I even drank their 2003 blaufrankisch for WBW #7. I have to admit, however...I usually hate pinot grigio. So much of it, even the "good" stuff, reminds me of a glass of water with a couple lemon wedges squeezed in -- bland, uninteresting and barely drinkable. After tasting this new release from Channing Daughters Winery, however, I now realize what can (and should) be done with this grape that has been abused by winemakers the world over. Winemaker Christopher Tracy fermented this 100% pinot grigio in eight stainless steel barrels and one new Slovenian oak hogsmead before blending in late March. Only 208 cases were produced, and last I heard it was almost sold out to the wine club already (which is common with their wines--that's why I had to join the club). Eyes: Very light gold with more of a lemon-yellow tinge. Nose: Juicy pear and some green apple, accented by faint mineral notes. Tongue: It's dry and lightly fruity with pear, apples and some citrus. Extremely refreshing with great crispness to balance the fruit, it also has a surprisingly long finish that ends with a little sweet spice and subtle hints of vanilla. Though medium bodied it features a light, almost weightless mid-palate that both Nena and I noted. Overall: Wow. This wine garnered the first A+ from either of us, so that says something. It would be delicious with cheese, most seafood or by itself all summer. We would definitely buy this again...if we have the chance before it sells out. I've long ignored pinot grigio/pinot gris because of the lesser wines made with it. I think it's time I explore some pinot gris from the Pacific Northwest. This wine has the complexity and chameleon characteristics that I like...it really changed as it warmed. I know. I know. This obviously isn't my white pinot for Wine Blogging Wednesday #10. It's been a busy couple of weeks and I'm a bit backed up on my tasting note posting, including these notes on a pretty nice chardonnay from Laurel Lake Vineyards in Laurel, NY. In the past, I've found Laurel Lake Vineyards' wines to be hit and miss...partially because I've gotten more than a couple corked bottles from them. But, this wine is a clear exception. Nose: When cold (right out of the fridge), it has a delicate nose of citrus and toasty vanilla. As it warmed, however, the vanilla aromas really swelled and were joined by tropical fruits like pineapple and papaya. Tongue: This wine is full bodied and offers a nice balance of fruit and toasted oak, which lends the delicious vanilla character. The finish is nice and fruity with hints of sweet spice. Overall: A nice wine and a good value. For me, a little acidity and/or mineral character could have really pushed this wine into the "great value" category, but Nena really started to love it as the night wore on. Drink it with salmon or roasted chicken. 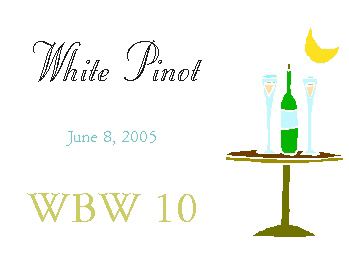 Wine Blogging Wednesday #10 -- White Pinot, hosted by Alice of My Adventures in the Breadbox is tomorrow, June 8th. It's hard to believe that we're already at the 10th vintage of this global wine blogging event. Wine Blogging Wednesday has definitely taken off...so join us tomorrow. Go out and get your pinot blanc, pinot grigio...any white pinot. And tell us allllll about it. Meet Christy Campbell, Author of "The Botanist and the Vintner - How Wine Was Saved for the World"
Admission is free and includes a wine tasting and, of course, you'll get to hear Mr. Campbell discuss his book. Autographed copies will be available for purchase. While free, seating is limited, so you need to call Ginny Clancy, Program Coordinator, at 631.632.9404 to reserve your seat. I can't make it into the city on a Tuesday night often, so I won't be there, but I am about half way through the book right now and I can tell you I'm REALLY enjoying it. I wish he were coming out to Stony Brook's main campus (which is about 15 minutes from my house). Check it out...it's not often that there's an interesting wine event that is FREE. Perfect? 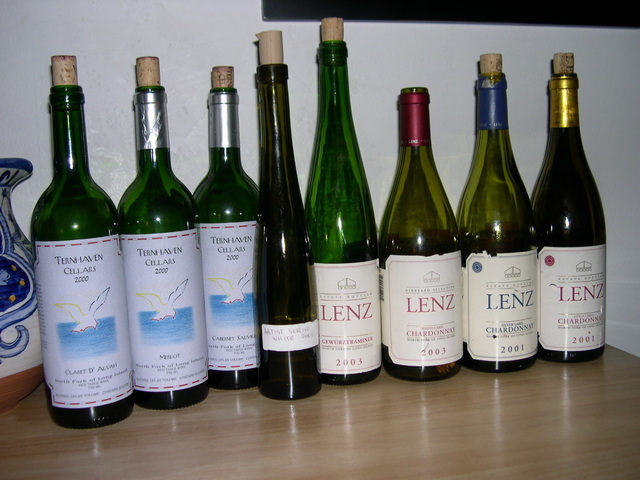 No, but because the wines are all from the 2004 vintage, they are young and, in some cases, still a little tight. 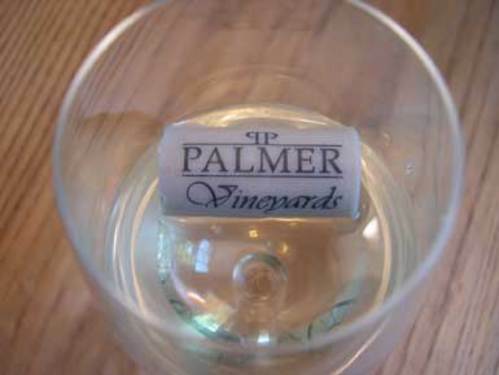 Palmer Vineyards 2004 White Riesling ($14) is a nice, light-bodied white for the wine newbies in any crowd. Its nose is lightly floral with hints of citrus while its palate offers tight, slightly underwhelming peach and other fruit flavors in an off-dry style. I think with time, the fruitiness will develop and grow, but I was left wanting a bit more acidity to balance the residual sugar. I tell anyone that will listen that gewurztraminer is the ideal white to serve with spicy Asian or Mexican food, and that goes for spicy party foods like my grilled wings, too. Palmer Vineyards 2004 Gewurztraminer ($17) features the expected exotic citrus aromas and flavors with a gently spicy finish. Again, it’s made in an off-dry style and a touch more acidity would have improved its balance. Make sure you don’t over-chill this one; it’s better only slightly chilled. Pinot blanc is one of the most under-appreciated varietals around and Palmer Vineyards 2004 Pinot Blanc ($13) was my favorite of these releases. Through a combination of steel and barrel fermentation, winemaker Tom Drozd has crafted a medium-bodied wine with delicate lemon aromas, fresh melon flavors and a citrus finish that is slightly creamy. If you think that sauvignon blanc from New Zealand is too harsh and California versions are just flabby Chardonnay wannabes, Long Island Sauvignon Blanc is for you. Though not the best one available, Palmer Vineyards 2004 Sauvignon Blanc ($13) is quite tasty and well priced for daily summer sipping. It delivers the grassy aromas I like and even a little “cat pee” (that’s a good thing with this varietal). On the tongue, it’s fresh and crisp with grapefruit and lemongrass. This is a good, everyday style of Sauvignon Blanc. It’s important to say again that these wines are still pretty young and they’ll certainly evolve with a few more months of bottle time. Try them at Palmer’s tasting room this summer and taste for yourself. Remember, ultimately it’s your palate that you should listen to. Me, I’ll stick with the Blancs – Sauvignon and Pinot. For more information on Palmer Vineyards, visit www.palmervineyards.com or call 722-9463. 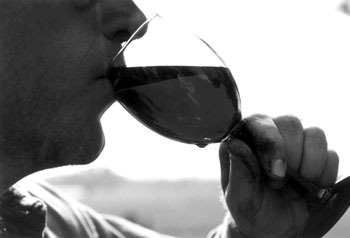 Wine Lovers -- What Do You Drink When You're Not Drinking Wine? We've all been there...at a party or non-fine restaurant...any place where the wine is either absolutely awful or just not really all that interesting. What do you drink in these situations? Or, at softball games...whatever light beer we have in the cooler. And nine out of ten times, if we're at a party, I'm bringing the wine anyway. I'd much rather drink any of the above over bad wine...are any of you SO wine-obsessed that bad wine is still wine worth drinking?